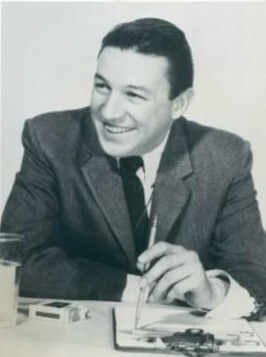 Legendary journalist Mike Wallace, who spent a formative decade in broadcasting in Chicago before moving on to a career at CBS in New York, died Sunday at ninety-three. Long before he became known as the dad of that Fox News guy, Chris Wallace, original “60 Minutes” correspondent Mike Wallace pioneered, along with producer Don Hewitt, a tradition of hard-hitting television journalism on their show that connected back to Edward Murrow and forward through Watergate, only to die somewhere along the time that Geraldo Rivera hit the scene. Most memorable was their devising of the televised ambush interview, wherein they would stake out, with cameras running, a subject who’d refused to respond to their request for an interview through traditional means, catching them at home or at work. As often as not, the refusal to answer their questions would be more damning than if they’d just sat for the interview. In a 2005 conversation with NPR’s Terry Gross (rebroadcast this week), Wallace said they eventually retired the technique when it became more about the theater than about getting to the truth. That might be the case, but in a world where seats of power and wealth have successfully built thicker walls between them and an increasingly timid press, this is a particularly effective tool in leveling the playing field in the public’s favor. At least Michael Moore keeps the ambush in his toolkit. Speaking of ambush, I bet former Chicago bartender Jessica Elizabeth Harr is wondering what just rocked her life. Consider the scenario. You’re hanging out after work and you’re blowing off steam with some acquaintances, you might even call them friends. One of them, a bartender named Jessica, had a really bad encounter with a customer and is pissed off. The customer was a person of color, and she blames the behavior on that trait, in words that never belong in polite company and, in this day and age, sound shockingly retrograde. A few others in the group pile on, prolonging and deepening the hate speech. Finally, someone tells the bartender she’s out of line, but gets berated for speaking up. You make a quick exit, and a mental note to never hang out with these folks again, deciding to forget the whole thing. A couple days later, the story starts its viral ascent. The blog Eater, a Chicago outpost of a national chain, quickly jumps in, as does Whet Moser at Chicago magazine—who actually spins it into an interesting riff on social media and employer issues—followed shortly by the Huffington Post. Then, in short order, New York Daily News and London’s Daily Mail pick it up. Finally, it makes it all the way to Chicago, when the Sun-Times reports on it a day after New York and London, and a full week after Townsend’s blog. The news is still making its way through to the Trib Tower, apparently. 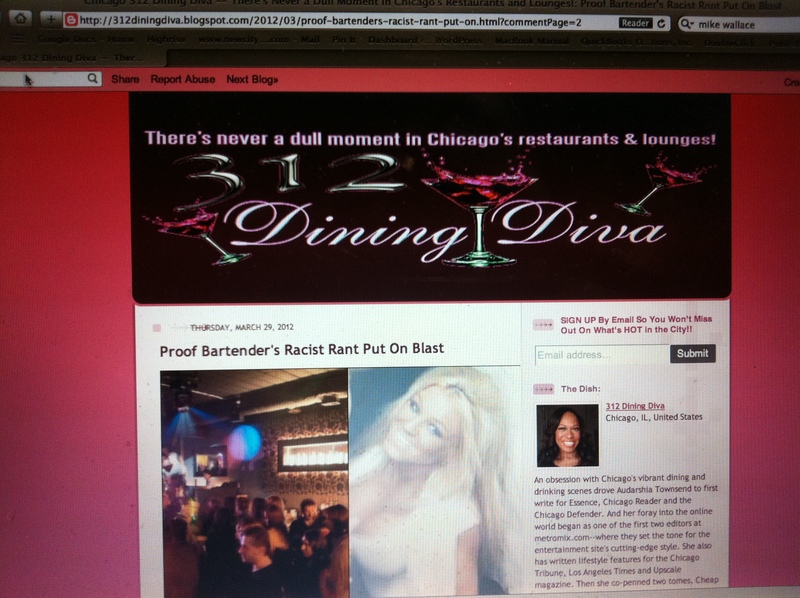 A week and a half later, the 312Dining Diva site is bulging with running commentary on the story, with 251 comments as of press time, and some of them nearly as reprehensible as the original Facebook six (though Townsend says she edited out most of the bigots). Threads include: Are African Americans poor tippers? Is this an isolated incident or is Proof a club with a problem with racial issues? And who instigated the slave trade? Interestingly, Andy J Cuthbertson, Angel Afterhours, and Andy J Cuthbertson’s sister have all allegedly used the forum for either apologies, self-defense or some combination thereof. I sent an inquiry via Facebook to whom I believed to be the Jessica Elizabeth in question, in hopes of an interview. I was interested in hearing her side of the story, especially curious as to what she’d experienced. I did hear back, via a Facebook message: “i think you’re confusing me with someone else ? I’m confused…”. When I clarified the context, she responded with “leave my last name out of that I have an attorney and that Facebook does not have my name and If you really wanted to know my Facebook was hacked and I now have an attorney handling all of this.” Before I could request clarification—after all, Facebook requires its members to use real names—she blocked me from any further messages. So what to make of all this? One, social media is media. That means you are spreading your conversations, if they take place on your wall, to all of your “friends” at a minimum, and possibly their friends, and possibly even the entire public domain. According to Townsend, she and Jessica Elizabeth were not Facebook friends but had eighty-four friends in common, and “almost a third were African American.” Champions of new media praise the democratization of voices, but not everyone is well equipped to use that power. Two, this is a story entirely of our time. Created on Facebook, reported on a blog, and devoured by commenters. Beyond the newspapers and television stations, the story has replicated across the blogosphere—someone even created a “Jessica Harr is a Racist Pig” Facebook page (1 like so far)—and the traditional media has been standing on the sidelines, reporting on the reporting of others. (I know, I’m reporting on the reporting on the reporting.) It’s unlikely that a traditional journalism source would have ever originated this story. it’s too micro in its detail—the participants, as reprehensible as they were, were neither public figures nor persons of power and the nightclub in question was not mentioned in the Facebook thread. Most journalists are admittedly far too nerdy to have known who Jessica Elizabeth was or where she worked. That being said, there’s a compelling case to be made for accountability being extended to the personal level like this. The offenders were expressing hateful views, after all, and there is a social value to exposing them, and to imposing a price for such views (loss of a job). Though the promise of social media is increasing our inter-connectedness, one of the byproducts of media fragmentation is an increasing insularity of social circles. Clearly, this group of friends thought it was acting in accordance with its own standards, oblivious to the larger circle of folks connected with it, or to more general standards of society at large. And so the network policed itself, which is a good thing. As long, that is, as it’s the community that is exercising this oversight and punishment, and not some higher authority, like the government. Or Facebook itself. Though Facebook seems to be a benign presence in this particular episode, this is a matter worth contemplation now that the social network has 845 million monthly active members, according to its latest press information. If it was a country, it’d be the world’s third largest, and would dwarf the United States with nearly triple the population. In this new world, there are only one set of rules: Facebook’s rules. What might have confused the racist friends in this case was some notion that they lived in a country that protected speech, even at its most repulsive. But they weren’t expressing themselves in America. They were in Facebook.